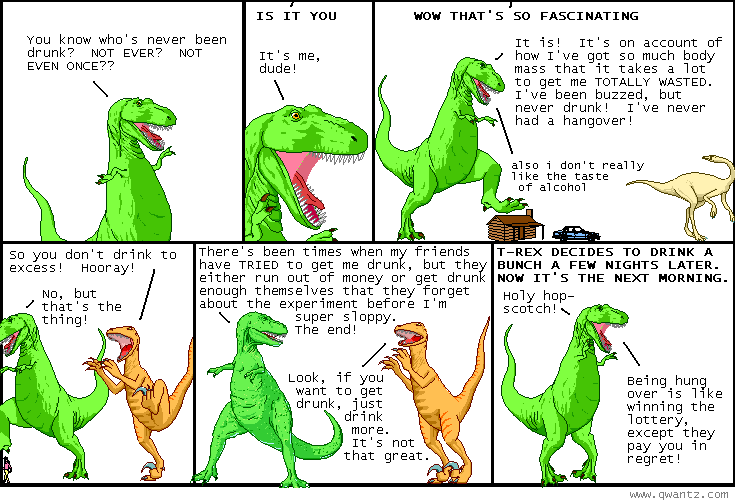 Dinosaur Comics - August 20th, 2007 - awesome fun times! August 20th, 2007: Guys the latest news on Jurassic Park IV seems totally awesome. They are giving the dinosaurs guns. There will be velociraptors holding submachine guns. Randall is going to die when he sees it. The guy in the article I linked to is all down on the idea and I really can't figure out why. If I met him I would say, hey, the question mark in your headline should be an exclamation mark! For serious. So hey, Toronto readers will be PLEASED to pick up Now Magazine this week, because there's a feature called "My Style" there in with colour photo of me talking about the clothes I wear and where I got them and for how much. GUYS, IT IS SO EMBARRASSING. Oh my goodness. It's a good article but I defy anyone to have a picture of themselves in print like that all over a city and not to feel what I will characterize only as "unending shame". It does have a nice mention of the Toronto Comic Arts Festival this weekend though! It'll be rad. You should come!